On December 19, 2016, the SEC entered an Order denying SEC whistleblower awards to two claimants, in part due to their failure to follow the procedures set fort in the SEC whistleblower rules. One of the award claimants had not submitted his or her information to the SEC on a “Tip, Complaint or Referral” form, also known as a Form TCR. According to the Order, the first claimant did not provide information that caused the SEC to open an investigation, inquire into different conduct as part of an ongoing investigation, or significantly contribute to the success of the SEC’s enforcement action. The first claimant therefore failed to satisfy the “lead to” requirement. The Order gives several different reasons as to why the second claimant’s application for an SEC whistleblower reward was denied. Like the first claimant, the second claimant did not satisfy the requirement that the information must “lead to” a successful SEC action. For further information about the “lead to” requirement, click here. In addition, the second claimant did not submit his or her information in the form and manner required by the SEC whistleblower rules. 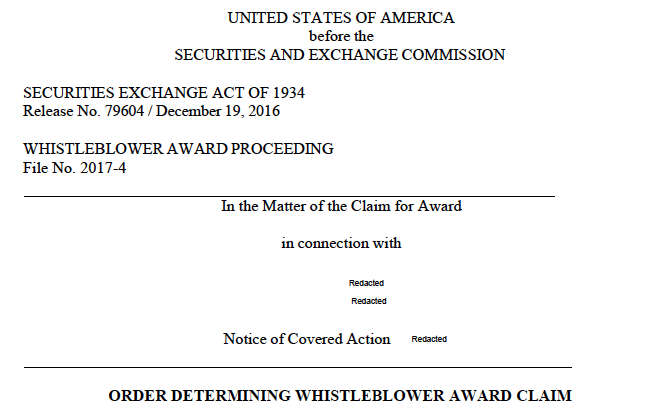 In denying the second claimant’s application for an SEC whistleblower award, the Order cites to Rules 21F-(8)(a) and 21F-9. 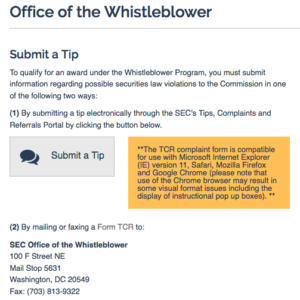 Among other things, Rule 21F-9 says that potential SEC whistleblowers must submit their information to the SEC either through the online Form TCR on the SEC’s website, or on a paper Form TCR that they must either mail or fax to the SEC’s Office of the Whistleblower (“OWB”). The Order emphasizes that the second claimant did not submit his or her information on either a paper Form TCR, or on an online version through the SEC’s website. Apparently, the second claimant did submit a tip to the SEC in some other format. Upon receiving that tip, the OWB sent the claimant a letter informing him or her of the requirement in the SEC whistleblower rules that information must be submitted on a signed Tip, Complaint or Referral Form in order to be eligible for an SEC whistleblower award.